There is a wide assortment of deer-hunting weapons, including high-powered rifles, shotguns, muzzleloaders, handguns and bows. Sometimes a hunter has the privilege of choosing which weapon to use. For instance, a hunter may choose to further challenge himself by using a bow and arrow or a muzzleloader during the general gun season. However, during specific seasons, such as archery deer or muzzleloader, regulations prohibit the use of high-powered firearms. The gun of choice for most sportsmen is the centerfire rifle, perhaps a bolt-action chambered for .270 or .30-06. 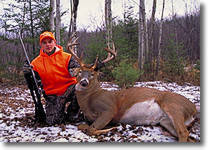 Its ease of operation and extreme accuracy make it the most dependable of all deer-hunting firearms. However, some states prohibit the use of high-powered rifles in heavily populated urban areas. In these situations, the shotgun or muzzleloader is used for safety reasons. These two firearms have good killing power and accuracy up to about 100 yards. After that, a heavy slug or conical bullet loses velocity and drops off dramatically, thereby expending its energy before it travels within range of nearby dwellings. A select few sportsmen opt for the high-powered pistol. Now holding a handgun on a buck and trying to deliver a killing shot at 50 to 100 yards is a real challenge for anyone. There are virtually no specific pistol seasons in any states. If your heart is set on getting a deer with a handgun you’ll have to join ranks with rifle hunters during a modern firearms season. The bow & arrow is an efficient hunting tool–out to 35 yards or so. As such, special archery-only deer seasons are the norm in September or October. A growing number of archers opt to use their bows and arrows during general firearms seasons. But then they must compete with crowds of gun hunters. Some states hold late-season archery-only hunts, giving bowhunters one last crack at tagging bucks.